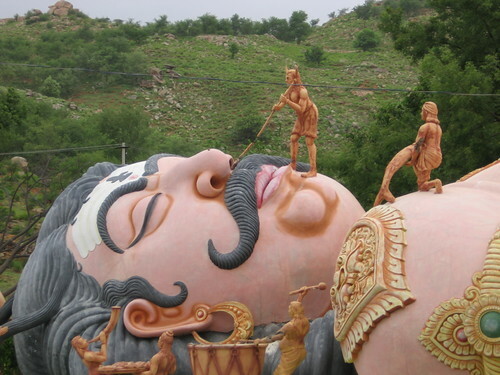 Two of Ravana’s brother are source of particular interest – Kumbakarna and Vibheeshana. Both, at some point advise Ravana against a war with Rama. However Vibheeshana is shouted at for this advise and leaves Lanka to join forces with Rama and betrays many of Lanka’s secrets to Rama. He is later anointed King of Lanka after Ravana’s death. Kumbakarna makes the same advice but follows it up by comforting Ravana speaking of an assured victory despite knowing fully well what was in store for him. Kumbakarna is eventually killed in battle. Kumbakarna’s actions are all too familiar. Actions like his are replicated in the Mahabharatha and is generally seen as the nobler of the two courses. Vibheeshana is often criticized for betraying his King and is commonly seen as an usurper and traitor. So then what is the confusion? Vibheeshana is (at the end of the epic) ordered by Lord Vishnu in the original form to guide people towards Dharma. He also becomes an immortal joining the ranks of Hanuman, Parasurama and Mahabali. What the _? I am not still fully clear why this action is considered correct. I am not at that level yet. But the original author clearly seems to think so. Feel free to read the original text and make sense of it. If you come by interesting commentaries, I would love to be notified. The intention that drives your action is perhaps more important than the action itself. From a different perspective, this episode reinforces the idea that there is no distinct line between black and white in such situations. I want to make a special note of this because it is very easy to get lost in the strongly polar natures of the main characters in the epics. The epics would seem to be of no practical use as situations or characters as seen in them would never happen in real life. In fact however, there is a large trove of such useful tips and indicators buried within them. Many answers are here. So take a closer look. It doesn’t look visually enticing, but I am pretty sure its darn good. No, I have not played the game yet. Now, I wasn’t expecting to write a post on a game, any time soon. Not even on DotA. But this is just too good a game for me to resist. I have been quite intrigued by the concept of Evolutionary Computation. One lazy Sunday, I started looking for more stuff on Evolutionary Computation. I found a lot. Particularly, a post-doctoral researcher’s blog. Julian Togelius. He’s published a paper on solving Sudoku using Genetic Algorithms. Serious stuff that! One of his other papers have been judged as one of the top ten AI game innovations of the year. This dude was one of the organisers of a Simulated Car Racing Championship atWCCI 2008. It seems there are not a lot of games available that actually use the latest Learning Techniques. It was very funny in the beginning when I looked at the games’ graphics( WCCI ). Not a ‘Need for Speed’ then. On further reading, I found more on the rules of the game. From a programmer’s stand point, I thought, not very easy to program a controller. All the various cases. How could it adapt?? Perhaps learn?? Neural Networks then?? Neural Networks are to put it very very simple terms, like a brain. ( Please note that this is a gross over-estimation, it resembles the brain only in that it can learn new stuff. It is not even close to the functioning of a brain ). Perhaps neural networks would have been the answer if the same question had been put forth a few years ago. Today, ANNs alone will not suffice!! It just got more interesting after that. I learnt that one of the Car controllers was evolved using rtNEAT( real time NeuroEvolving Augmenting Technologies ) developed by Kenneth O Stanley at University of Texas at Austin. NEAT not only evolves the best neural network of a given structure, it also evolves the best structure for the purpose. Fantastic stuff. As I kept reading, link after link. I get here. The page gives a detail overview of how NERO is played and how it is being developed. Please do read it. Its an interesting read. You’ll start wondering what kind of games will be the next big trend. I have added on my links lists some of the more interesting blogs I have found during my research. Anyone interested in AI, please do have a look at these pages. I definitely plan on writing more posts on my own discoveries on the Web about AI, more particularly, Evolutionary Computing. And next time, I hope I try to convey more technically what I actually wish to convey. Cheers. All these days, I have been positive, that the Human Race is simply not capable of destroying itself. Perhaps now, its about time I changed my views. I had forever hoped this day would never come. Alas, it has. My days in Japan had rejuvenated my beliefs a little. Japan was clean and green and its people well aware of their duties to the environment. And then, I land at Coimbatore, a completely balded city. Dusty and in a ruin-like state. All in the name of development. I return back to Chennai, and as always there is Coovum ever ready to show off as the most violated, polluted river on the face of the Earth. My heart cringes in despair, EVERY time I take a ride on the local trains. I can’t bear the sight of the river. The sludge. That smell. And still there are those who pass over it everyday, not giving a damn as they pass by. It is only once in a long time that I watch TV. And call it misfortune, to add to my despair, ‘An Inconvenient Truth’ was on on HBO. The hope the man has should really be commended. The ignorance of the American people, intrigues me. Why is it that everything is treated as hoax. Why? Armstrong never landed on the Moon. The 9/11 was perpetrated by the Government. And Global Warming is a lie. Are they frigging out of their minds? Why? Money. Isn’t that what everything is all about. In the US, its about increasing the profits. The fuel efficiency law in force in the country is similar to the one in India, I think. And when a talk arises of putting a more stringent rule into effect, American car makers are the first to start swearing. Ford and GM are suffering heavy losses. If such laws are forced, where would they sell their cars? On the other side of the world, Toyota and Honda are flying high. And their market has the strictest fuel efficiency and emission laws. Japan. What an irony. Won’t their markets expand if GM and Ford actually embrace a strong emission rule? In India, its about minimising expenses / trouble. Why bother to treat the sewage? Its not my problem. Why bother to properly dispose the waste? Its not my problem? Why even bother to look for a proper place to spit? Why not spit here? Why look for a dust bin to dispose the chocolate cover? No one cares. Why should I? There was no ice in the North Pole this Summer. I can imagine the response of anyone who I bother to tell it to. “O < like I care >”. Global warming is not a hoax damn it. Its here. And if you don’t do something about it, F*&^, you are not going to do anything anyway. And the TATAs hailed for bring the Industrial Revolution to India, yada yada etcetra etcetra yawn…, aren’t doing pretty things to the environment either. Being an e-member of Greenpeace isn’t every satisfying. Global Warming. Thats not the only thing thats made me completely lose my faith in Humanity. Terrorism. What a fantastic concept, eh! The volatility pervading this Unity makes me sick. Of what use is such a unity. The only use of this is that one can swear at the other, at the other’s society and still not be called a racist. Sometimes I think we’d be better off as twenty different countries. And I pray to God I don’t start about politicians in the Country. Gandhi would be greatly ashamed. I came home this weekend. Saturday, serial blasts in Bangaluru, and Sunday in Ahmedabad. Local news channels in each state crying out that it is their cities to be targeted next. Aaaahhh! What are they trying to be prove??? What the hell do they want? What do they gain by killing loads of innocent civilians? Frankly, I refuse to be intimidated by a bunch of demented fools. Jihad, indeed. If only someone told them what it truly means. Are they going to kill everyone who is not a fundamentalist Muslim? And a pathetic note challenging the police five minutes before the blasts. Sniggering, they must have been as they wrote the note. What a bunch of cowardly ignorants. Just look at this all from a higher plane… What an uncivilised act. So many cellular automatons, so many simulations. No simulation could possibly predict that any civilized population would eventually destroy itself. I was convinced that the analogy drawn between the human race and any virus. And perhaps then an automaton could properly predict the ultimate fate of such a race. But such a destiny!!!! I cannot pen on anymore. I am either so full of spite or despair, or both. Please note that I have not intended to cause any harm, sentimental or otherwise, through this page. I am simply so full of despair and been this way for sometime now that I just had to pen this down. Pardon any inaccurate detail in the page, and please bring it to my notice. I’d be forever indebted.